Maui is the second largest of the main Hawaiian Islands (after Hawaii's Big Island) encompassing 727.2 square miles (1883.5 km2). The island is made up of two shield volcanoes, West Maui Mountain and Haleakala. Both are joined by a low-lying isthmus. The Hawaiian Islands are all the result of volcanic activity. A few of these volcanoes were located close to one another, so close that their lava flows overlapped, merging into a single island. The island of Maui was formed by two shield volcanoes that were so close together that they created an isthmus between them. The volcano located in the island’s northwest, named West Maui Mountain, is the older of the two. Since its creation it has eroded a lot. Its highest peak is Pu'u Kukui at 5,788 feet (1,764 m). The other volcano is Haleakala, rising to 10,023 feet (3,055 m). It is the largest dormant volcano in the world. At one point in time Haleakala rose to 15,000 feet (4,572 m) and was the largest mountain in the world when measured from its base at the ocean bottom. But like all the Hawaiian islands, Maui is eroding and its summits are shrinking. Eventually, in millions of years, the island will be just an atoll and then sink below the ocean's surface. The eastern slops of Maui's mountains are green and lush with rainforests and waterfalls, while the western slopes are dry. That's because the predominant, moisture-laden tradewinds are blowing from the northeast. As they hit the island's mountains, the moisture comes down as rain. Maui's mountains shield the western shorelines from much of this moisture. The last volcanic eruption on Maui was around 1790 at Haleakala's Southwest Rift Zone. Even though Haleakala is considered dormant, it is not extinct yet and volcanologists believe that it can come back to life. 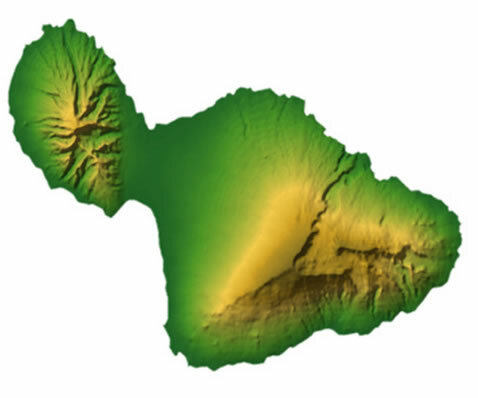 About 20,000 years ago Maui was joined together with the neighbor islands of Molokai, Lanai and Kahoolawe. It was one big island referred to as Maui Nui, meaning Big Maui. There was a mini ice age at this time which caused the sea level to drop. As the islands eroded and the sea level rose, Maui Nui became what is now four separate islands. The ocean channels between these four islands are relatively shallow. Geologists believe that in about 15,000 years from now, Maui will be two separate islands. The low-lying isthmus will then be covered with water and form a new ocean channel.